57 Commonwealth is located on the north side of Commonwealth, between Berkeley and Clarendon, with 55 Commonwealth to the east and 59 Commonwealth to the west. 57 Commonwealth was designed by architect Carl Fehmer and built ca. 1874, one of symmetrical pair of houses (57-59 Commonwealth). 57 Commonwealth was built for wholesale cotton merchant John Appleton Burnham, Jr., and his wife, Mary (Clark) Burnham. They previously had lived at 5 Newbury. They also maintained a home in Manchester. John Burnham purchased the land for 57 Commonwealth on May 28, 1878, from Richard Codman, who had purchased it from the Commonwealth of Massachusetts on January 23, 1868. Click here for an index to the deeds for 57 Commonwealth. The library and dining room of 57 Commonwealth are illustrated and described in The Book of American Interiors by Charles Wyllys Elliott, published in 1876. The library is described as 17 feet by 25 feet, looking out on Commonwealth Avenue, with a pine floor, hooded mantel-piece, and bay window. The dining room is described as 18 feet by 24 feet, with a mantel piece that is “massive and quiet,” with American ash paneling, tinted with a dark stain. John Burnham died in November of 1910. Mary Burnham continued to live at 57 Commonwealth until her death in August of 1926. Their two unmarried daughters, Helen Clark Burnham and Mary C. Burnham, lived with her and continued to live there after her death. Helen Burnham died in January of 1946. Mary Burnham continued to live at 57 Commonwealth until her death in March of 1954. On May 11, 1954, 55 Commonwealth was acquired from John Burnham’s estate by real estate dealer Thomas J. Diab. On July 5, 1955, 55 Commonwealth was acquired from Thomas Diab by real estate dealer David A. Finn (Finkelstein). He and his wife, Hilda J. (Jacobson) Finn, lived in Newton. In February of 1956, he applied for (and subsequently received) permission to convert the house into sixteen apartments. On May 25, 1957, 55 Commonwealth was purchased from David Finn’s estate by Winsor, Incorporated. The president of Winsor, Incorporated was Florence Beth Pockwinse, a social worker and lodging house operator who lived at 31 Brimmer. 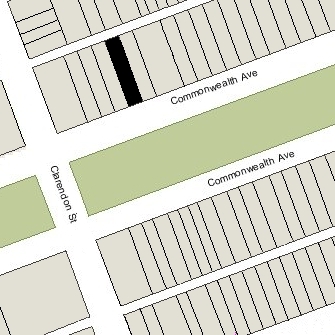 On July 31, 1962, 57 Commonwealth was acquired from Winsor, Incorporated, by real estate dealer Earl Carnes Munn, who lived in one of the apartments. He previously had lived in an apartment at 325 Beacon. 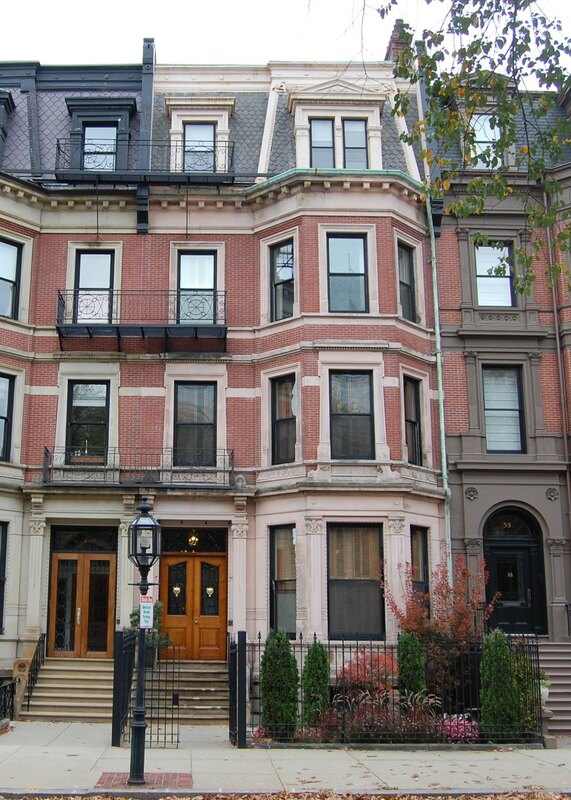 He continued to live at 57 Commonwealth until about 1872, when he moved to 346 Beacon. On January 18, 1972, 57 Commonwealth was acquired from Earl C. Munn by George S. Davis, Peter S. Davis, Lee S. Davis, and James S. Davis. 57 Commonwealth an apartment house in 2015.